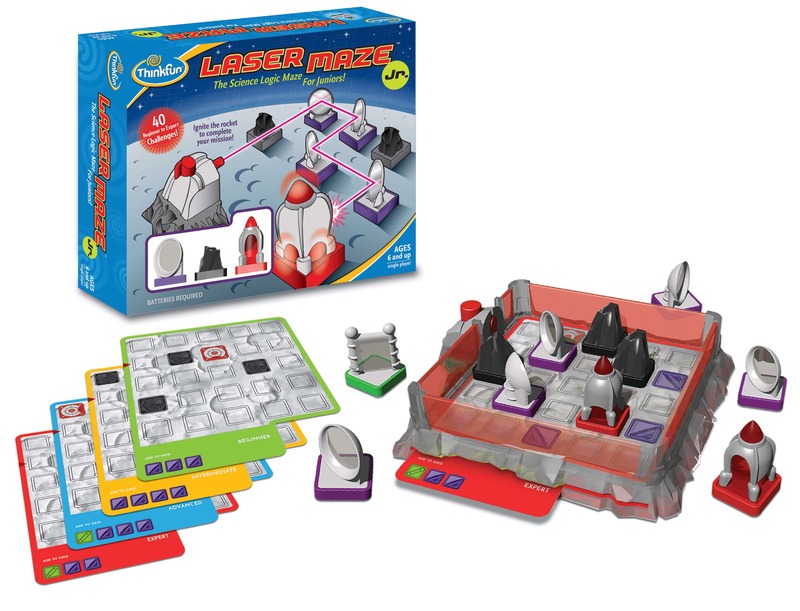 Home » Family Board Game Review: Laser Maze Jr.
Family Board Game Review: Laser Maze Jr.
Laser Maze Jr. is a single player logic game designed for ages six and up by Thinkfun. This game challenges the player to set up tokens to match a challenge card. The player then adds mirrors to the board. The objective is to reflect a laser beam so it lights up the rocket (or rockets with more difficult cards) light up. The components of the game are good quality solid plastic. They are designed with grays and blacks as well as bright red, green, and purple. These are the perfect size for an early elementary school age child to manipulate with ease. The player selects a challenge card. There are four levels of play: easy, medium, hard, super hard. The 40 cards are numbered and get progressively harder as they move within each level of play. The player selects a card and it is inserted under the Game Grid to shows the player where the Rocket target as well as any Space Rock Blockers are placed. At the bottom of the card the additional pieces needed to complete the challenge are displayed. The player then manipulates the additional pieces around the Game Grid in order to reflect the laser. The challenge is successful once the Rocket Target is lit up by the laser beam. The player can then select another card and complete an additional challenge or conclude their game. This is a wonderful game for early elementary school children to develop their logical reasoning and problem solving skills. This game is recommended for ages six and up, however my four and a half year old son was able to easily manipulate the pieces and begin working on the easy challenges with some parental or older sibling support. This is not a games intended for teamwork and collaboration, however especially for younger players it naturally modifies to a collaborative the format to make it a partner or group activity. If your child is interested in logic and problem solving activities this is a great game to sit down together with and work through the challenge cards. There are rich opportunities for discourse that can build their confidence and guide them to attempting different strategies as the difficulty level increases across the challenge cards. Laser Maze Jr. is a wonderful STEM (Science, Engineering, Technology, Math) game to develop a range of skills including: logical reasoning, problem solving, and guess and check. The children I observed were motivated to get the Rocket Target to light up, and got quite excited when they are able to accomplish that goal. This game is a valuable addition to a family’s game collection for families with younger children. Mother, Educator, and Board Game Editor. Our Tips for Attending (and Enjoying) a Fan Convention!